We couldn’t be happier to open our first daycare facility in the vibrant community that is Somerville! We are lucky enough to be located right across from Union Square; an epicenter of amazing places to eat, drink and shop local unique businesses. There’s an infinite amount of places and neighborhoods to check out, so we’d like to introduce ourselves to the area while highlighting some of our favorites! Our new home! Union Square is home to an array of restaurants, bars and small businesses you won’t find anywhere else. The Independent is a Union staple and has been serving the neighborhood amazing drinks and upscale pub favorites since 2001. Right next door is Brass, another fine option for American fare. If you need a quick tune up or a new bike altogether, head over to Somervelo for local expertise. If you’re looking for a well-curated neighborhood record store, look no further than Grooves for your vinyl fix. In the mean time, drop your pup off for a full or half day of daycare so you can eat, drink and shop knowing your pup is also having a blast! 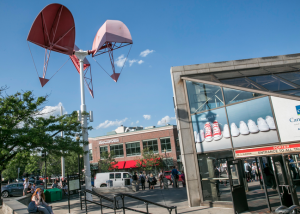 Only a 15 minute walk from Union, Davis Square is home to several Somerville institutions and fantastic places to eat and shop. It can get fairly packed on the weekends, so your best bet is to explore on an off day and give yourself plenty of time to roam and explore. If you’re looking for unbelievable BBQ in a unique Southern-style setting, head down to Redbones on Chester St. The Somerville Theater is a historic venue to catch a movie or a small concert while enjoying some amazing architecture. For a healthy dose of childhood nostalgia, head over to Comicazi and check out their impressive collection of new and vintage action figures, comics and pop culture memorabilia you may have forgotten you needed. Let’s not forget our friends over at JP Licks as well; stop by to grab yourself a cone and some Cow Paws dog-friendly ice cream for your pup! 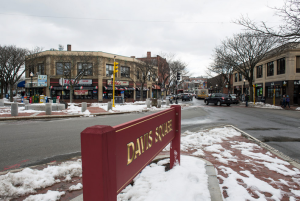 Centrally located between Cambridge and Somerville, Porter Square has a dynamic mix of big and small businesses, restaurants and conveniences. With its own stop on the T’s red line, Porter is easily accessible and a great place to start when exploring what Somerville has to offer. The main shopping center has everything you may need on an errand-filled Sunday, from the curated hardware and housewares at TAGS to the unique selections at independent Porter Square books. If you’re craving authentic and filling Mexican food, you can do no better than Anna’s Taqueria; located diagonally across from the T station. Christoper’s is a fantastic American bar and restaurant adjoined with it’s own live music venue (Toad) where you can catch an array of jazz, folk and other acts on a nightly basis. 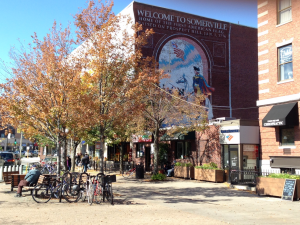 Somerville is an ever-growing destination for some of the best eating, shopping and sightseeing Boston has to offer. Among the countless options available as a Somerville resident or visitor, there are just as many for our four-legged friends as well! Few areas of the city are as dog-friendly, so it is with great excitement that we open our first doggie daycare in this wonderful part of the city. We offer both full and half-days of daycare from 7am-6pm weekly, including an option for transportation to and from daycare. Stop by our 4,000 square foot location, located right outside of Union Square at 230 Somerville Ave. with your pup today!